In the UK 2011 has been quite a year for Ryan Gosling. Blue Valentine was released on the 14th of January, and then in September we saw the release of Drive and Crazy, Stupid, Love. By late October The Ides of March hit the cinema screens, making it pretty hard to deny that 2011 is the Year of Ryan Gosling. Not only has Gosling dominated our screens by number of releases, but it is the quality of the films he has been involved in that really makes the difference. Drive was a directorial tour-de-force by Nicholas Winding Refn, which brought out the badass in Gosling. Blue Valentine was a raw and honest portrayal of the fate of a romance without the necessary maintenance. Crazy, Stupid, Love portrayed another failed relationship; this time Gosling took on the role of ladies man/dating coach, to hilarious effect. This brings us to The Ides of March, a classy political thriller and George Clooney’s fourth feature as director. Gosling plays Stephen Meyers, an idealistic Junior Campaign Manager for the Democrat’s presidential candidate Mike Morris (George Clooney). Meyers is convinced that Morris is the one man in America who can make a difference to the lives of ordinary people, stating “I’ll do or say anything if I believe in it, but I have to believe in the cause.” And he does believe in the cause, until he meets a young intern called Molly (Evan Rachel Wood) and discovers something equivalent to his worst nightmares. From here all hell breaks loose, both within the campaign and within Meyers’ own system of values. It is here that Ryan Gosling shows us the kind of rounded performance he is capable of. Having convinced us of Meyers’ integrity and idealism, Gosling soon makes the transition to a revenge driven individualist. Unlike Drive where Gosling internalised nearly every emotion, The Ides of March shows him reaching for more raw emotions; in this sense the film has more in common with Blue Valentine. 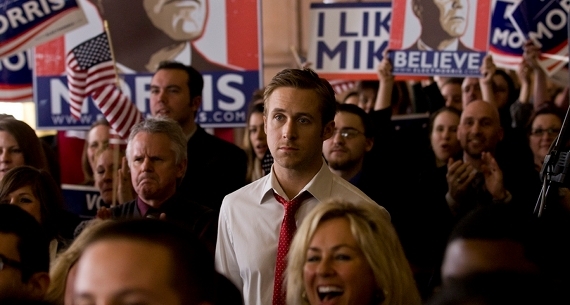 The Ides of March sees Gosling playing wildly divergent character traits within the same character, to utterly convincing effect. With this film Ryan Gosling seems to have skilfully established himself as an actor of some authority, not just ‘one to watch’.